AMSRS Fellow becomes Australia’s oldest PhD graduate. HomeFeaturesAMSRS Fellow becomes Australia’s oldest PhD graduate. 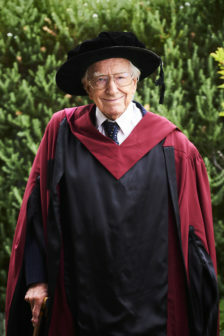 At 94 years of age, Dr Bottomley graduated from Curtin University on February 5th with a Doctor of Philosophy after completing his thesis, which examined the teaching methods of five progressive English educators who introduced an understanding of science into the curriculum from 1816 to 1885.